THE hue and cry in recent months over failure to protect the interests of drug trial victims has finally forced the government to act. The Central Drugs Standard Control Organisation (CDSCO) under the Union health ministry has drafted a formula to compensate drug trial-related injuries and deaths. But the formula seems to have been framed in a hurry and has little logic. Going by the draft, only high-salaried trial subjects stand a chance of receiving a compensation decent enough to make up for their loss. If the victim is poor, unemployed, diseased or a non-working woman, the compensation would be mere pittance. “There is enough evidence to support the fact that in developing countries like India mostly poor and unemployed are either targeted or willingly participate in trials for free treatment,” says N B Sarojini, director of Sama, a Delhi non-profit that works on women’s health issues. The formula has been posted on CDSCO’s website and is open for public feedback till September 3. The compensation plan considers four aspects—monthly income (A), age (B), severity of disease, if any (F), and the percentage of injury, if any, sustained due to the clinical trial (D) (see ‘How the formula fails to deliver’,). Factor A has been fixed as 50 per cent of the victim’s monthly income in case of death and 60 per cent in case of injury, assuming the person spent this much on his family. This clearly ignores the amount a person spends on personal needs. The victim should also be compensated for losing his productive years. “The factor marginalises the poor, unemployed individuals and homemakers. They are kept under minimum wage category and eligible for far lesser compensation than a high-earning person,” says S Srinivasan, managing trustee of LOCOST India, a generic drug company in Vadodara. This factor is unethical for another reason. In our society the care burden is already skewed against women. “Should their unpaid work of raising a family be equated with minimum wage?” asks Nandini Kumar, a scientist who has worked with the Indian Council of Medical Research. Sarojini voices another concern. 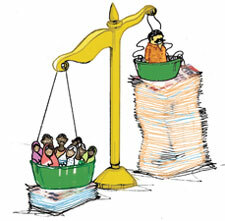 The formula does not take the variations in income in the unorganised sector into account. For example, a daily wager might earn more than the minimum wage in one month but less in the next. The second factor, B, in the formula is an arbitrary figure based on “imponderables in life”. The draft says it takes the age of the participant and the period of active career into account. The factor is identified through a table, prepared by CDSCO, that starts from the age of 16 and assigns a random number to a particular age. The number decreases with increase in age till the age of 65 years after which it stays constant. For example, B for a 20-year-old is 224.00 and for a 35-year-old it is 197.06. “We understand that the one who died at the age of 20 had more productive years ahead of him, but at 30 the person is most likely to have dependants. Then why is he getting lower compensation than the one who died at 20?” asks Srinivasan. Repeated calls made by Down to Earth (DTE) to CDSCO to understand the concept of “imponderables” fell on deaf ears. Sources reveal that the table has simply been lifted from Schedule IV of the Workmen’s Compensation (WC) Act of 1923. The Act aims to provide workers and their dependants compensation in case of death or injury arising out of employment. “It is plain callousness of the government to equate risk of participation in clinical trials with working for a livelihood,” says an ethicist working with the government, on condition of anonymity. Working for a living is an individual necessity while a clinical trial participant makes a significant contribution towards medical science by offering his or her body for research. For this contribution he or she should be paid much more. In clinical trials, we do not have an employee-employer set up where some amount of worker’s annual salary goes to the insurance risk pool. In case of an accident, the compensation paid is over and above that insurance money. 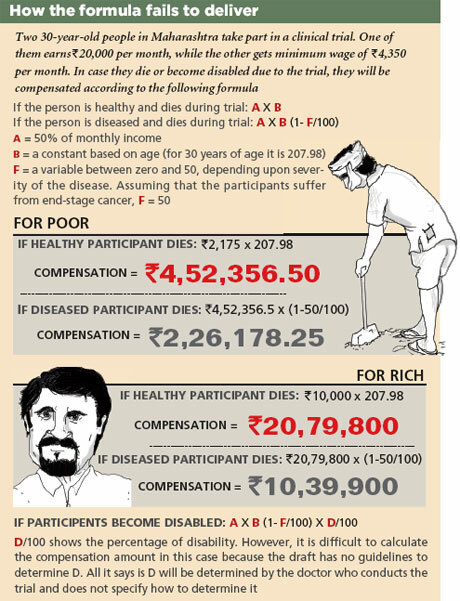 Public health activists believe the compensation should be equal for all, irrespective of age and income. But some experts disagree. “The way income has been included in the formula is impractical but age is important for calculating compensation because it is the only variable that gives an idea about the years of life to be lived and provided for,” says Kumar. But the problem is that survival rate depends on circumstances and varies for men and women. This is a statistically proven fact and not “imponderables”. How then can there be a uniform factor for age? It seems the government just wanted an easy way out, says the ethicist. The formula changes when people with diseases participate in the trial. A new factor F is introduced to accommodate them. But by doing this, the compensation becomes even less and is reduced by 50 per cent in case the subject is suffering from a fatal disease. “Pharmaceutical trials require both healthy and diseased subjects. It is unfair to undervalue the diseased and give them lesser compensation than healthy people,” says Sarojini. A diseased person is entitled to less compensation due to an existing lower functionality. But what if he/she dies an early death due to the trial? asks Amar Jesani, founder of Indian Journal of Medical Ethics. Further, the task of fixing F is left to the principal investigator, the doctor who conducts the trial. “The principal investigators are likely to work under the watch of pharmaceutical companies and may lower the factor to minimise the compensation,” fears Anand Rai, a public health activist in Indore. The formula gets modified further if the subject develops a disability due to the clinical trial. Factor D is introduced. But the draft does not provide any clarity on who will determine the percentage of disability and how. “Whatever be the value of D, except zero, it would further reduce the compensation amount,” says Srinivasan. Sources reveal that the percentage of disability would be the same as in the WC Act. This would be absolutely illogical because the kind of disability acquired in an occupational accident would be different from that of a clinical trial. Wolf to guard the sheep? The draft guidelines specify that an Ethics Committee (EC) would calculate the final amount of the compensation, taking all factors into account. But ECs themselves cannot boast of an impeccable track record. “How can we place the entire compensation matter in the hands of ECs that have been found to be most corrupt?” asks Rai. EC members are often themselves involved as investigators in other trials and may get protective towards pharmaceutical companies, he adds (see ‘Ethics on trial’, DTE, June 15-30, 2011). Public health experts suggest that India can develop a compensation system on the lines of Australia. There, the clinical trial compensation is decided mutually by the sponsor and the subject. In case of a difference in opinion, the sponsor bears the cost of hiring a mutually acceptable independent arbiter to decide the case. “Strong laws ensure that the arbiter is not biased towards the sponsor,” says Jesani. In India, the Good Clinical Practice guidelines for clinical trials provide that the research subject, who suffers physical injury because of a clinical trial, is entitled to compensation subject to confirmation by ECs. But only 37 of the 2,370 subjects who died due to clinical trials between 2007 and June 2012 were compensated. Each victim’s family was given a paltry compensation of Rs 2.21 lakh on an average. The amount is nothing when compared to the profit the pharmaceutical companies make if a drug is successful in the market. Repeated e-mails to the Organisation of Pharmaceutical Producers of India, an umbrella body of pharma companies, regarding the draft yielded no response. Pharma giant GlaxoSmithKline welcomes the formula.